I grew up in the 60’s and 70’s, during the revival of arts and crafts in the bushy outskirts of Melbourne. Although not a sewer as such, I had been exposed to many different crafts, encouraged by my Mum who had an ‘artistic eye’ for everything. I went into Primary teaching because I could not decide which of my passions to follow art, music or physical education? Fast forward to now, I live in Northern Victoria on a fifth generation farm, surrounded by sheep and Riverina plains. I started quilting about 20 years ago when my children were babies. Our local learning centre was offering hand piecing classes. I can’t remember why I decided to take it up, except perhaps to try something new and get out of the house. After about 10 years of making and giving away quilts, I was starting to feel unsatisfied just going from project to project. My husband said “you should design your own quilts” – famous last words! It was then I found the connection between art and quilting, and begun making pictorial quilts. I especially enjoyed depicting people interacting with their environment. My pieces are often emotive and originate from a primary source as much as possible. I find inspiration all around me, even in the mundane things. The local flora and fauna is beginning to appear in my work, and I am only beginning to appreciate what is there. Drawing and painting is also becoming a mainstay of my practice, which helps to inform my sense of colour and composition. Of great import is to achieve a balance between family, work, community and nurturing my passion for art (I don’t always get it right). I have recently retired from teaching to work full time on this passion. I am hoping to build a studio in the future, as at the moment the whole house tends to become cluttered with quilting and art stuff! I use many techniques to make my quilts, but raw edge fabric collage is the one I rely on most. I find it very liberating. No seam allowances to turn under and you can work over it anyway you like: layer, stitch, paint. I also incorporate a lot of my own surface designed fabrics in my pieces, such as lino and screen printing, thickened dye painting, discharging, resist etc. I use both hand and machine stitching, together and seperately depending on what the piece needs. I like to use the machine like a pencil to draw. As an emerging art quilter I have pieces in exhibitions around the country and overseas. My work is appearing in private and public collections and various media. I had my first solo exhibition in Oct/Nov in 2017. 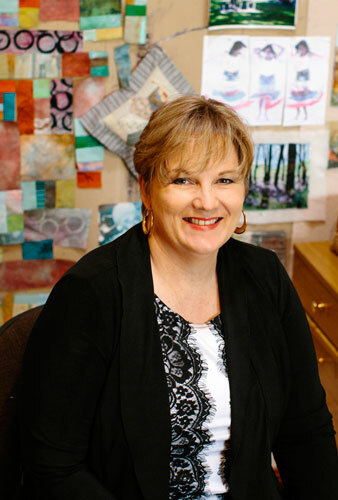 I am a member of Studio Art Quilt Association (SAQA) and Ozquilts. I am available to conduct workshops and will consider commissions. Hello Russell! Lovely to hear from you. Do you still live in the Kyabram area? I have been thinking a lot about your talk yesterday and also about upcoming workshops. I think I could really learn some new techniques from you. Do you have any workshops coming up, I know I would have to travel but seem to do lots of that, anyway. My email is prhawkey@bigpond.com. Thank you for your interest. I usually exhibit in Vic Quilters events and other competitions. I am working towards a solo exhibition in 2015, probably in Melbourne. Information will be on this website. Linden.